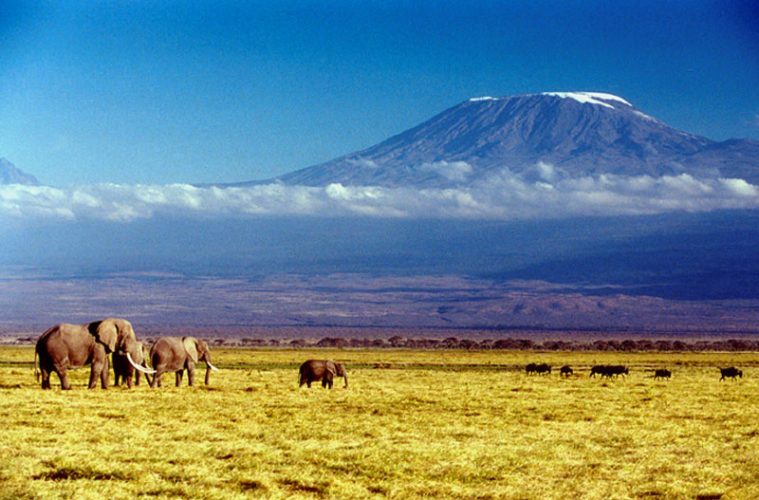 Kilimanjaro is the world’s highest free-standing mountain at just under 6000 metres in height. It is a volcanic mountain with three separate cones: Shira, Marenzi and Kibo. The first two are extinct, but Kibo is only ‘dormant’, meaning that it could potentially erupt again at some point in the future. The highest definitive point of Kilimanjaro, at 5,898m (19,341 feet) to be precise is at Uhuru Peak which is located on the edge of Kibo’s crater, colloquially known simply as ‘The Summit’. 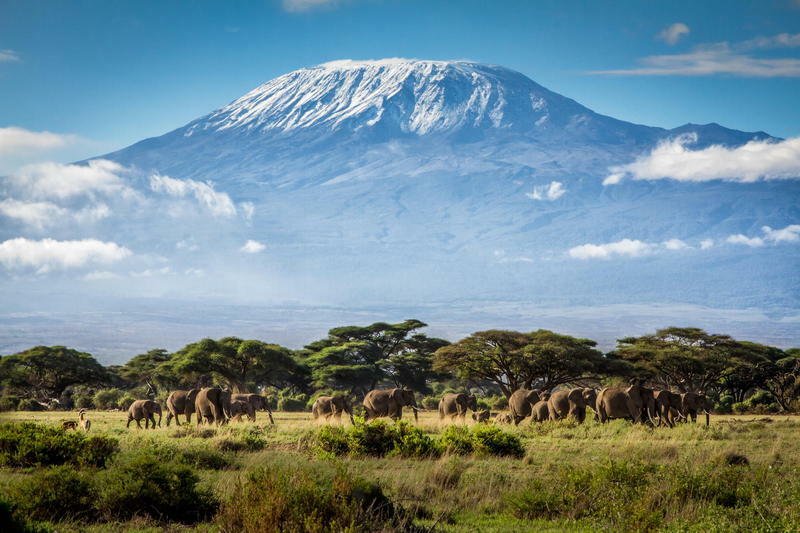 Mount Kilimanjaro is the stunning centrepiece at the heart of the Kilimanjaro National Park, which is found in the United Republic of Tanzania. This is a designated World Heritage Site, home to numerous rare and protected species of animals as well as extensive and unique plant life. Visitors travel to this beautiful part of Africa for a number of reasons including the scenery and the wildlife, but many are there for the ultimate experience of tackling the mountain itself. There are many different motives for taking on the Kilimanjaro challenge: often it is on a fundraising basis for a favourite charity, but could equally be a self or group challenge. Around 25% of challengers already have climbing experience and are often moving on from mountains in Europe. The remainder of this guide is aimed at those intrepid travellers who feel they are ready to challenge the mighty Kilimanjaro for themselves and to do so in an informed and confident way. One of the most essential things to understand is that the ascent of Kilimanjaro involves up to four distinct climactic changes. In the lower regions, the temperature is relatively warm (25-30°C), whereas approaching the Summit, it can be as low as -20°C, meaning that there is no one set of suitable attire for the task. Starting with fundamentals, boots are not only essential; they must be well-fitted and supportive. Choice of material is a personal thing: some climbers prefer leather, whilst others prefer lightweight synthetic. Whichever the preference, time must be taken in choosing and above all, purchasing in time to wear them in thoroughly. The trick with clothing is layering, with four separate layers, excluding underwear. Beginning with comfortable, supportive underwear (this includes men and women) then a good quality thermal two-piece ideally made from Merino lambs wool – it is well worth investing in two sets. Next up is a fleece with a warmth rating of 300 and trekking trousers followed by a lightweight water-resistant ‘soft-shell suit’. The outer layer of a down-filled (rather than synthetic-filled) jacket plus ‘hard shell’ waterproof trousers, with the highest possible rating, is expensive but could easily be the difference between comfort and hypothermia. For gloves and socks, the ideal is 2 pairs thin, 1 medium-weight and 1 extra thick for both. Extras should be packed in case of losses as well as for hygiene reasons and the best quality available should be purchased – the same goes for quality when choosing hats, neck warmers and gaiters/leg warmers. There are also numerous other personal hygiene and comfort essentials to consider e.g. baby wipes, snack food, a ‘Swiss Army’ style knife and so on. It is best to try and find a happy medium with how many ‘extras’ to pack, bearing in mind that they will have to be carried in a back pack for the duration of the ascent. Correct clothing and equipment are absolute necessities to avoid unnecessary risks to health, but it is costly. Never go for ‘cheap and cheerful’ when purchasing essential clothing or equipment; good quality second-hand is by far the better option. Most tour operators are linked with experienced retailers who can offer good advice and provide the right clothing etc. at a discount if purchasing. Alternatively, most items can be hired for the duration of the tour. Eating as much food as possible can contribute greatly to the chances of successfully reaching the Summit. Whilst on the trek, native porters will set up camp ahead of the climbers to provide three suitable meals each day. Some tour operators provide a hot meal at lunch time, whilst others opt for a nutritious packed meal to shorten stoppage time. Breakfast is usually porridge followed by sausage and eggs. A hot lunch is likely to be a thick soup or stew with plenty of fresh bread and dinner will be up to three courses, finishing with fresh fruit for dessert. Cooking and dining takes place inside a large, purpose-built ‘conference’ tent, adapted especially for this purpose. It also doubles as a social area for groups of challengers to relax together and share their experiences. Except for the Marangu route which has huts for sleeping and eating, top quality three-man tents are provided per two people. This allows plenty of room to rest comfortably as well as for clothing and equipment. Some operators also provide ‘toilet’ tents, so bear in mind that the alternative is a cold prospect at night! 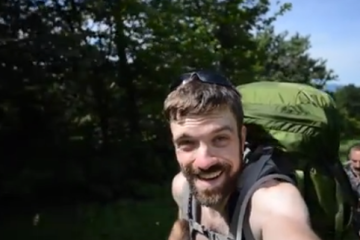 The highest possible ‘comfort rating’ should be chosen for both sleeping bags and under-mattresses, because rest is just as crucial as plenty of food and good hydration on this type of journey. How fit should you be to climb Kilimanjaro? A good level of fitness is very important. An equal mix of aerobic exercise for endurance, anaerobic for strength and hill walking is the ideal combination. All walking and climbing exercise should be carried out wearing the boots that will be worn during the Kilimanjaro attempt. Some tour operators offer ‘boot camp’ walking/climbing opportunities in areas like the Peak District of Derbyshire and Snowdonia to help challengers get a better idea of their current/required fitness levels and to get expert advice on their ongoing fitness programme. Those without previous climbing experience are definitely advised to take part in at least one before the big event. 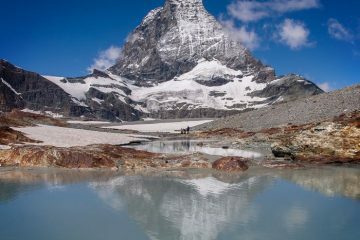 December to March, then June to October are the two popular trekking seasons. At these times the temperature is between 25°C and 30°C at the base of the mountain, which is more comfortable than at other times of the year. Nevertheless, this drops by approximately 1°C for every 200 metres ascended, meaning that near the Summit it is positively wintery. Mountain weather is also notoriously unpredictable, so always be prepared for difficult and unexpected events. 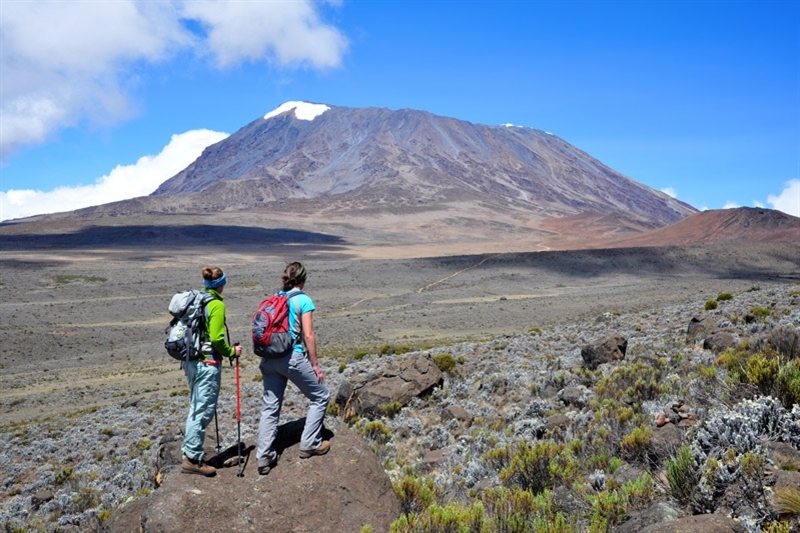 There are 6 official camping/trekking routes mapped out for the ascent of Mount Kilimanjaro, which vary in terms of their degree of difficulty and the time needed to ascend, as well as their scenic opportunities. The most popular route on the mountain is Marangu, but this is possibly for the wrong reasons. There is no camping on the Marangu Route as there are sleeping huts at suitable stopping points, which gives would-be challengers the impression that Marangu is an ‘easy’ route. 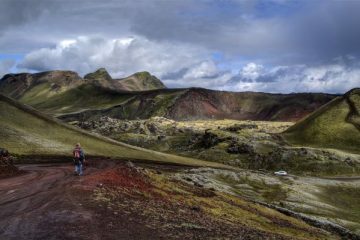 Also, many tour companies boast that the Summit can be achieved in just 5 days on this route (6-7 are ideal), but attempting this leads to not only a harder climb, but also a lower success rate. The other disadvantage is that Marangu is descended by the same path as ascending, therefore precluding the opportunity to see different parts of the mountain on the way down. The Machame Route equals Marangu in terms of popularity and is equally busy in the peak season. The average climb time is 7 days, allowing plenty of opportunity to observe the various zones that it passes through. 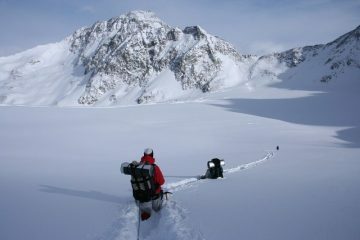 On the approach to the Summit, challengers can choose to take the most straightforward approach via Stella Point, or it can be tackled from the notorious, icy Western Breach. This is one of two routes which approach Kibo from the West. The first day on the Shira Route is taken up with crossing the Plateau. Many challengers opt to spend extra days here and take a longer route across the Shira level. This offers them the opportunity to see sights like the Shira Cathedral, which is moulded from lava as well as to enjoy secluded camping away from the mainstream. 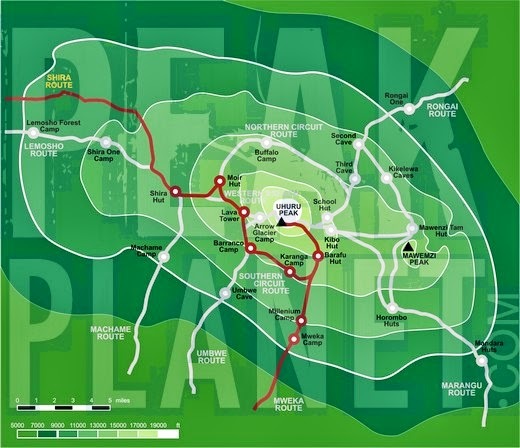 This route eventually merges with Machame, so the latter part of the climb can become very busy at certain times of the year. The second of the two routes approaching the summit from the West, Lemosho is another very popular choice. It is a slightly longer climb (average 7-8 days) with a good success rate. Lemosho crosses the Shira Plateau and then features a long stretch of forest, which adds the extra time to the climb as a whole. Again, Lemosho eventually meets up with Machame and the options for the final Summit approach are the same. This is the only Northern approach to the Summit. It is the least populated of all the climb routes, as it is the steepest and most arduous. 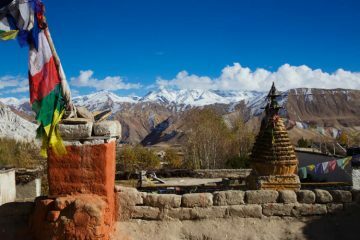 This route takes a minimum of 7 days because the steepness requires a one day ‘level’ hike for acclimatisation purposes. The Rongai Route offers the maximum opportunity to view African animals in their natural surroundings, as well as some absolutely breathtaking scenery. Descent from this route is usually via the Marangu Route, offering a chance to see ‘the other side of the mountain’ quite literally. Last and certainly not least, is the Umbwe Route. 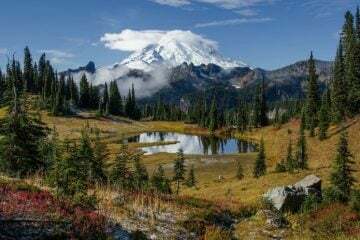 This route begins to the South of the Summit and the first two days cover some very steep and difficult trails, it is generally considered to present the biggest, but most rewarding challenge. Due to the rapid ascent, the third day is spent trekking across the Barranco Valley to acclimatise; from there the climb merges with Macame, Shira or Lemosho up to the Summit itself. Although this is technically the shortest route to the Summit, it is now only used as an alternative descent route. Take the time to investigate which vaccinations are required in Tanzania and make sure that they are carried out in plenty of time to offer immunity before travelling. This is especially the case if opting to take a course of Malaria tablets (recommended for some routes). Make sure you include the cost of relevant vaccinations in your budget. Never underestimate the gravity of altitude sickness, it can be fatal. A person who becomes unwell should assume that altitude sickness is the cause. Because altitude sickness is caused by a lack of oxygen at high altitudes, symptoms can include feeling weak/tired, headaches, lack of appetite, insomnia, dizziness, nausea and vomiting. It affects people in different ways, but any sign of the symptoms should be taken very seriously. A good tour company should employ guides or chaperones with sufficient medical knowledge to see the signs and offer advice in the event of suspected altitude sickness. This advice should never be ignored in a ‘foolish’ attempt to achieve the Summit. Good hygiene practices are very important, whatever you decide to take over and above clothing and sleeping equipment. Always carry products such as anti-bacterial gel, baby wipes, diarrhoea pills and water purification tablets. As with all challenges, preparation is the key. Physical fitness and stamina are the obvious essentials, but having a positive mental attitude is of equal importance. Knowing as much as possible about Kilimanjaro before departure cannot fail to help with the challenge. Reading books, searching the Internet and speaking to previous challengers should all be undertaken in order to get a good overview of both the good and bad things. The Kilimanjaro challenge is certainly not one to be taken lightly. Around 20,000 people make the attempt every year, of which about 40% actually make it to the Summit. Many more also make it to within 1000 feet, being unable to ascend further. Please bear this in mind: there are a number of fatalities every year, most being caused by altitude sickness and being aware of this is a very important thing. Always remember, reaching the ‘actual’ Summit and spending a few minutes there is hardly the point of the challenge; look at the bigger picture, the whole week-long experience and consider that to be an immense ‘once in a lifetime’ achievement in itself.